Eccentric Heel Drops are a popular method prescribed, advised, and suggested by doctors, physical therapists, athletic trainers, etc. They say you should do eccentrically loaded heel drops to 'strengthen' the calves and Achilles Tendon. Let's talk about that 'strength', and what eccentric heel drops are -really- accomplishing. You might think that you're getting stronger, but what's really happening is that the eccentric loading decreases strength-limiting factors that impede your body's ability to create force. Should I Do Heel Drops? Should I do Eccentric Heel Drops? If you have Achilles Tendonitis or Achilles Tendonosis, you bet, you certainly should. It's not one of the methods I suggest in my Reversing Achilles Tendonitis ebook, but that's a whole different topic. Working within the 'eccentric loading' concept, doing heel drops (essentially they're the opposite of calf raises) has proven to be an effective method of strengthening lower leg structures and reducing the symptoms of Achilles Tendon issues. Having said that, it doesn't work for everybody, because Achilles Tendon Pain shows up for a variety of different reasons. Heel drops isn't going to work for everyone. But again, that's a whole other topic. 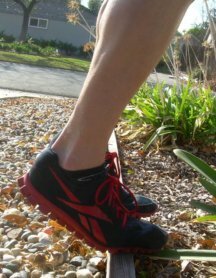 So, what do eccentrically loaded heel drops do, and what beneficial effects can they deliver? The power of doing heel drops with a focus on eccentric contraction (lengthening) comes from what's happening with the nervous system. People do heel raises to create strength. Like lifting weights. That's using a -concentric- contraction. But heel drops uses an -eccentric- contraction. Muscles are always either concentrically contracting (shortening) or eccentrically contracting (lengthening). **** IMPORTANT TRUTH!!! Muscles DO NOT stretch. The either contract short or long. Connective tissue stretches. Something very powerful happens when you eccentrically lengthen a muscle structure. Ready to find out what that is? Not quite yet. First this. Heel drops aren't like lifting weights. Heel drops are all about interacting with the nervous system to remove limitations on strength. So you don't GET stronger. You get access to your already existing but prevented from accessing strength. Maybe it's a minor difference, but to a geek like me, it' makes all the difference. And it's makes a difference to your ability to walk, run, and jump whether you know it or not. Ok, so heel drops cause the nervous system to make things work better. How? What? Here we go. Pay attention as I break it down. 1. All muscle contraction (eccentric and concentric)happens because of the nervous system sending a signal to the muscle fibers. 2. One of the main aspects of the Tendonitis mechanism (including tendonosis) is that muscles get tight and stay tight. The Pain Causing Dynamic will explain that. 3. So with time and use of muscles, the nervous system makes things tighter and tighter. 'Too tight' becomes normal. Then later when things get even tighter, the nervous system sets that to normal. That's how you end up TOO TIGHT. 4. Muscles and connective tissue being too tight for too long means that the tendon has been getting pulled on 24/7 for months and years. Now wonder it starts to hurt. 'At Rest' now means 'constantly working and pulling on the tendons and other structures'. 5. You hurt. Somebody tells you to do Eccentric Heel Drops. 7. As you do, as your heels lower towards the ground, your muscles are contracting 'long'. In other words, your toes and ball of foot are on a platform. You slowly lower your heels. 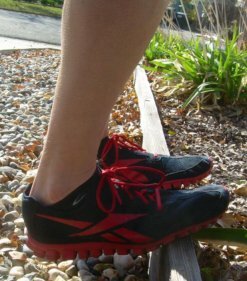 As your heels lower, your calf/soleus/achilles structure(s) lengthen (you'll feel it as a familiar stretch feeling). This lengthening happens because the nervous system is telling the muscles on the back of your leg to eccentrically contract, which means they are contracting but becoming longer. 8. So your too-tight, too-short muscles are NOT stretching (connective tissue stretches, remember?). They are LENGTHENING. 9. A muscle is a shock absorber. Put five fat guys in a car and there is NO shock absorbtion available. The tighter a muscle is, the less strength potential it has. The tighter your calves and soleus are, the less able they are to perform work. Thus, the tighter a muscle is, the less strong it is. It's not weak, it's just not able to create force. Again, it's an important distinction. 10. When you eccentrically lengthen the muscle, you are telling the nervous system to turn down the dial on how tight it holds things. Eccentric contraction is a Muscle Energy Technique, meaning it's using the nervous system to help reset how tight the nervous system holds a muscle. 11. So. You hurt because your muscles are too tight and aren't able to their jobs as well as they want to. Eccentrically lengthening with heel drop exercises will effectively make muscles less tight and thus more able to perform work. The better your body can perform work, the more active you can be with less pain. BONUS: Don't forget about Magnesium for Tendonitis as an important factor in muscles being able to relax and lengthen and work optimally. Any of these situations would likely benefit from heel drops with an eccentric exercise focus. Return to the top of this Eccentric Heel Drops page. Go to the www.TendonitisExpert.com home page.